Being the father of two boys, I often find myself digging through Hot Wheels cars in toy aisles of various local stores. For several years, these $1 diecast cars have been their favorite toys to collect (which has been nice on my wallet compared to something like action figures.) Usually, we can barely get out of the store before they are opening up the package to check out their new rides. I was a big Hot Wheels and Matchbox collector as a kid in the '80s, but unfortunately only a handful of my cars made it through time to pass down. But over the past several years, I decided to start a new collection of retro pop culture cars that both companies have continued to produce. It's always bothered me that I've had to store them because our house is limited in space now with 3 kids and only 3 bedrooms. But over the past week or so, I got an idea for a unique way to show off my Batmobiles, DeLoreans and various other vehicles still on the card...a room border! I've watched several YouTube videos, but most are vertical displays. Those works well when you have a great quantity of cars, but stacking them hides the great card art for the special collections. So I decided to create a horizontal display that can be used as a room border for a kid's room or man cave and will properly display the entire card. Plus, with this approach you can easily slide out your cars to display new ones anytime you feel like it! 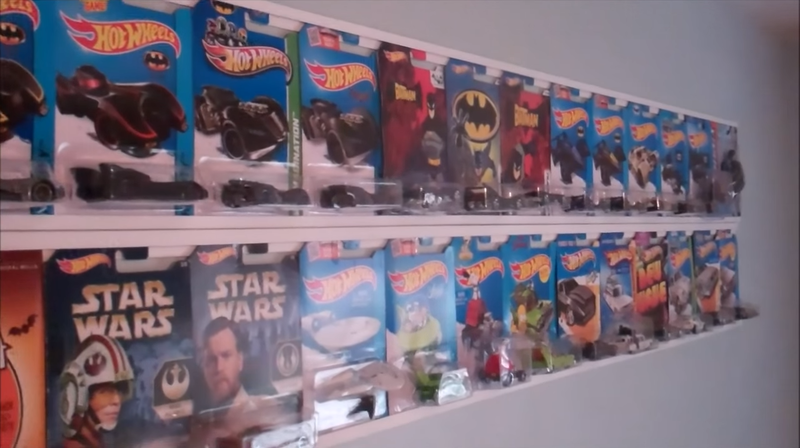 I created a DIY video to explain how to make your own display border and also take an inventory of some the cars in my collection! The cost of supplies for what I did in the video was less than $20 so this is also cost effective and will not damage the wall if youever need to remove it. Watch the video below and let me know what you think!